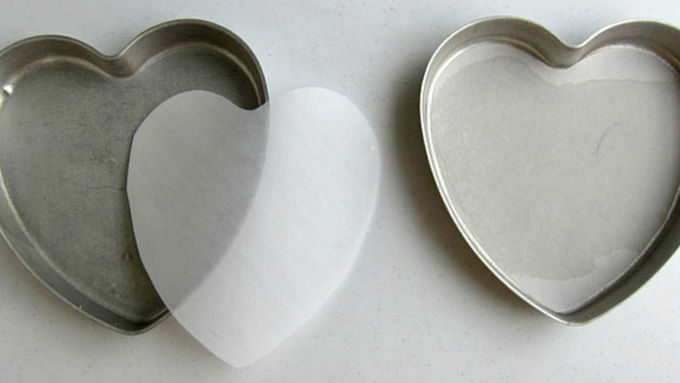 Spray four heart-shaped pans with non-stick cooking spray and line with parchment paper. Bake cakes for 20-25 minutes until a toothpick inserted in the center comes out clean. 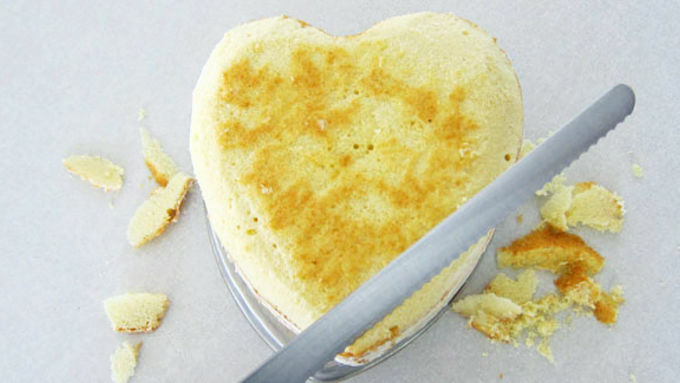 Allow cakes to cool completely, then remove from pan and level them by cutting off any parts that puffed up past the edges. 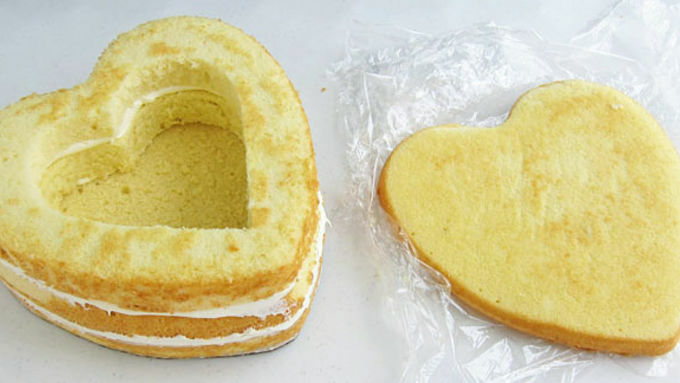 Set one cake on a heart-shaped piece of cardboard. 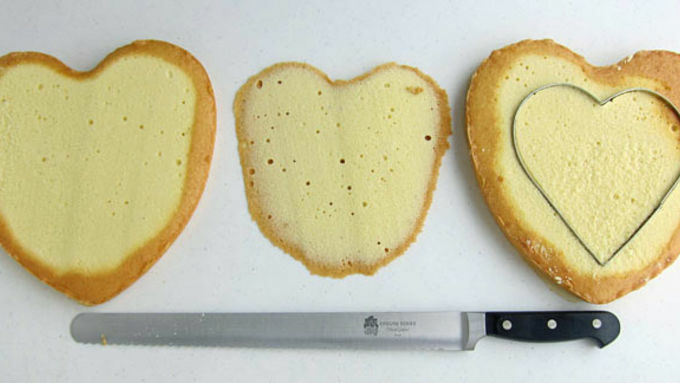 Cut 6-inch hearts out of two of the other cake layers. Whisk frosting and whipped topping together. 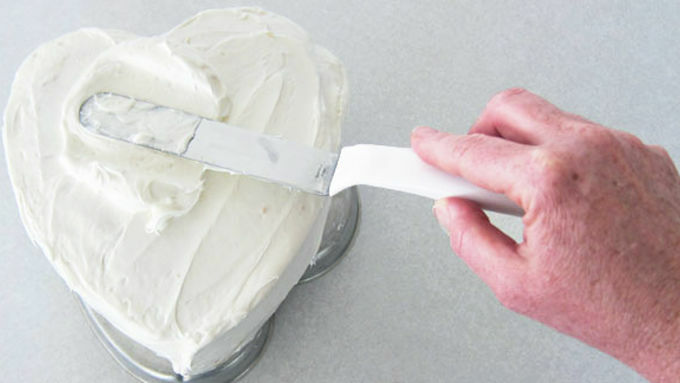 Spread or pipe frosting around the edge of the bottom layer. Stack the one cut out layer on top, then pipe on more frosting and add the second cut out cake layer. 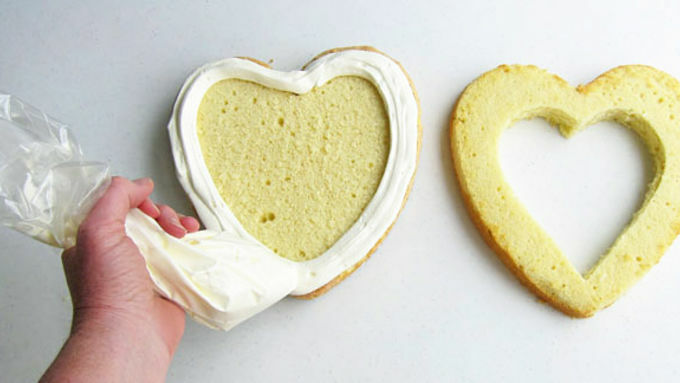 Fill the heart-shaped hole with strawberries, and spread frosting around the top edge of the cake. Place the final cake layer on top. 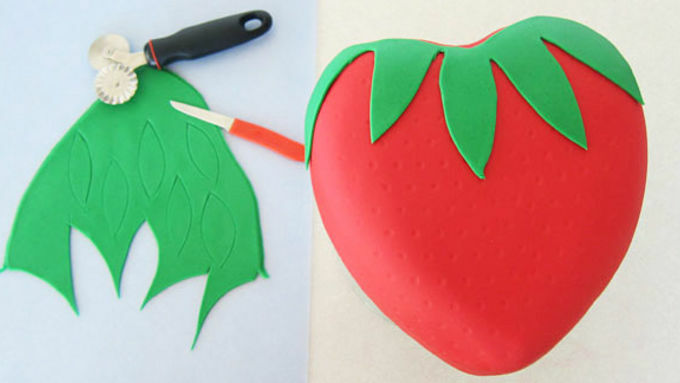 Carve cake into a more rounded-looking strawberry shape, if desired. 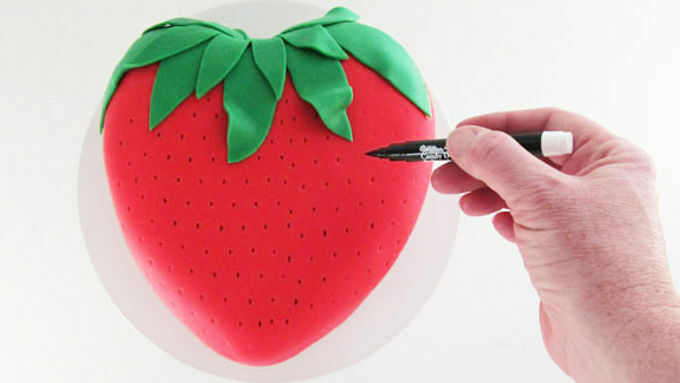 This step is optional, but it really gives the cake a natural strawberry shape. It's pretty easy to do. Just carve the top edge curving downward and the bottom edge curving upward. Cover the cake with the remaining frosting, smoothing it out well. 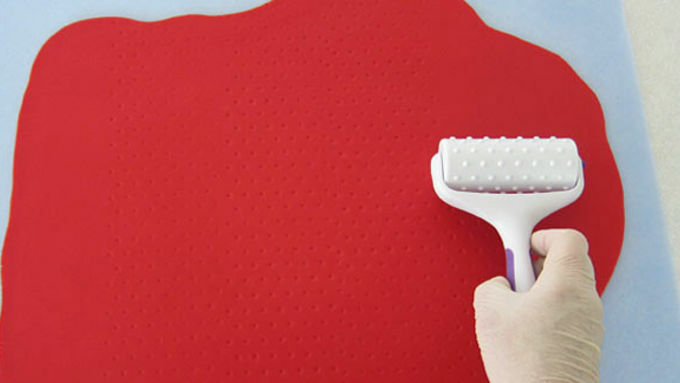 If you aren't using fondant, be sure to tint the frosting red before doing this step. 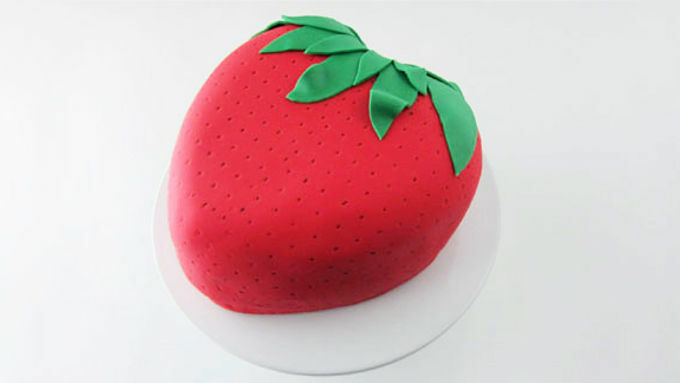 If you are covering your cake in fondant, smooth fondant will look nice, but if you add indentations to it, your strawberry will have a more natural appearance. You can purchase fondant rollers with a dot pattern at craft stores and they are simple to use. Just roll out your fondant and then gently roll the pattern over the fondant. Cut leaves out of green fondant and attach to the fondant covered cake using a very small amount of water. If you want, you can even curl your leaves up a bit to give them a more natural look. Draw on seeds using a black food coloring marker. Serve cake the day it is made. 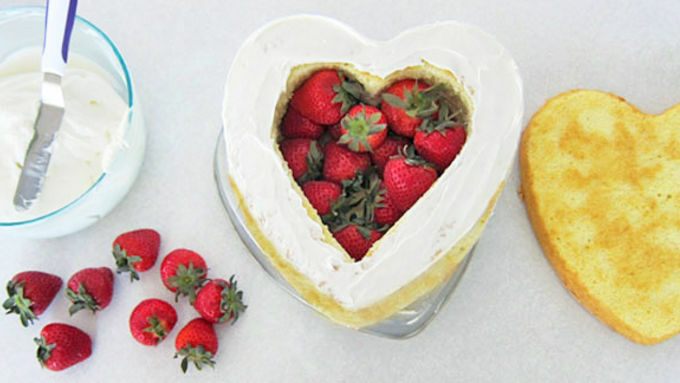 This cute strawberry-shaped cake holds a special surprise inside – even more strawberries! In the spring and summer months my go-to dessert is strawberry shortcake. I love the combination of cake with whipped cream and fresh berries! So, I thought it would be fun to create a strawberry-shaped piñata-style version with fresh strawberries hiding inside. 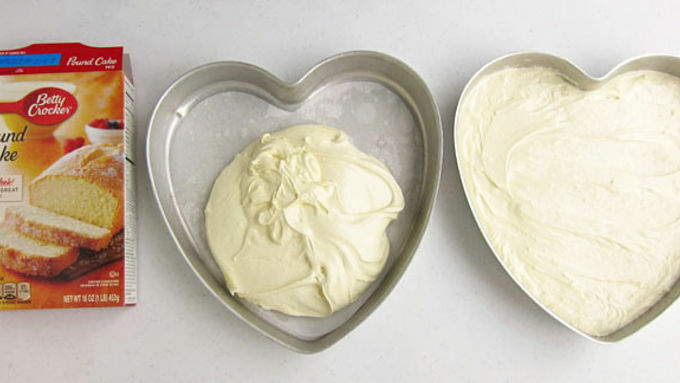 The easiest way to create a strawberry-shaped cake is to bake your cakes in heart shaped pans. I covered my cake in fondant, but if you prefer, you could color frosting red and spread it over the cake. For a really smooth and shiny look, heat the frosting until it's thin enough to pour over the cake. Mini chocolate chips can be used as seeds. RELATED: How to Use Fondant Fresh strawberries hidden inside a cake won't stay fresh for too long, so be sure to add them and decorate the cake the day you plan to serve it. Instead of washing the strawberries under running water, wet a paper towel and brush the dirt off the strawberries. This will help keep the berries fresh. Celebrate summer with this impressive piñata style strawberry cake at your next party or backyard barbecue. 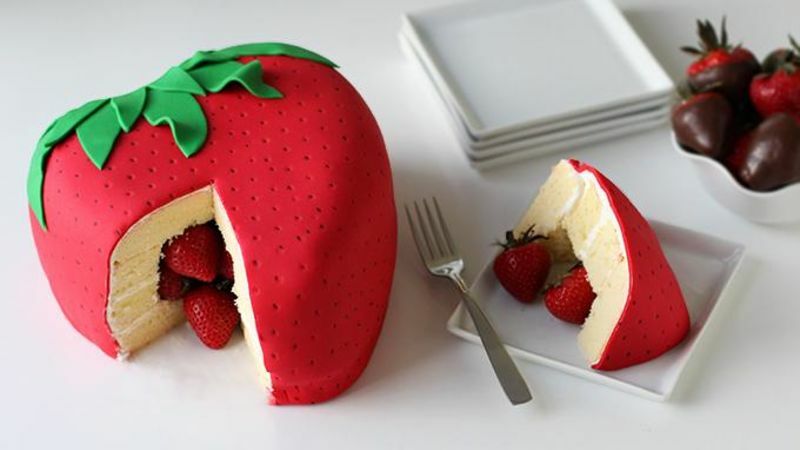 Serve the cake whole, then slice into it so everyone can see the strawberries hiding inside!